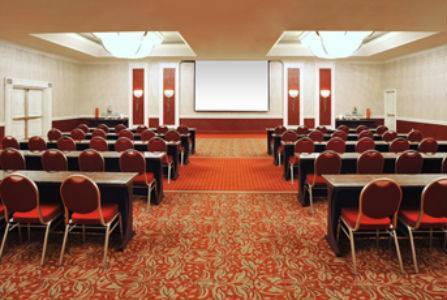 Welcome to the Crowne Plaza Annapolis! We are located near the excitement of downtown and historic Annapolis, sailing capital of the world. Were also conveniently located within walking distance to well-known chain restaurants and shopping at Westfield Annapolis Mall. In downtown Annapolis enjoy attractions like shopping, historic attractions and waterfront restaurants, United States Naval Academy, Maryland State House and more. The William Paca House, Rams Head Live, Sandy Point Park and Annapolis historic tours are also only minutes from the hotel. Guests can enjoy remarkable amenities including family friendly accommodations, room service, flexible meeting space, sundry shop, restaurant, bar, sun deck, Jacuzzi and indoor pool. Guests can stay up to date on their fitness routines with our 24 hour Fitness Center and state-of-the-art equipment. We know how important it is to stay connected, that is why we offer complimentary high speed Internet access in all of our newly refreshed guest rooms. Begin your day with breakfast at our on-site restaurant, Annapolis Bar and Grill and relax in our indoor pool and Jacuzzi when you come home in the evening. Experience the beautiful Chesapeake Bay and many local historic attractions while traveling to Annapolis. Westfield Annapolis MallLocated across the street and winthin walking distance from our hotel, the Westfield Annapolis Mall has over 100 stores and restaurants to dine and shop at. Catch a movie at the movie theater located in the mall. Annapolis Town CentreAnnapolis Town Centre is located 13 minutes from the hotel. Stores include Target, Bed Bath and Beyond and more. Dine at one of the many restaurants. William Paca House and GardenThis historical landmark is an 18th century Georgian mansion in Annapolis, Maryland. The William Paca House was a signatory of the Declaration of Independeence and a three-term governor. Prince George's StadiumPrince George's Stadium is the home of the Baltimore Orioles' Double-A affiliate in the Eastern League, the Bowie Baysox. Westfield Mall AnnapolisFind your favourite store and the newest shops for fashion, beauty, lifestyle and fresh food only at Westfield Annapolis.